It seems life is busy for everyone we know, packed full of important must-do and want-to-do things that fill up the calendar and keep us all going in different directions. Today we enjoyed a pause in the activity and lingered over brunch with some neighbors. The menu was simple, much of it prepped ahead of time, and offered variations of a few old favorites. My goal was to enjoy interesting company and good conversation, not to spend ages in the kitchen fussing over complicated items. Awesome Sticky Buns are RL's favorite breakfast treat, but I rarely bake them unless we can share a large batch with company. This familiar recipe was reworked last night on an emergency basis - I ran out of brown sugar to sprinkle inside the dough before rolling it up. Drat! I did not want to drive to the store again. Hmmmm, white sugar with cinnamon could substitute, but it wouldn't bring enough flavor to the party. A can of Solo Almond Filling would substitute for the brown sugar as an experiment. Result: the flavor addition was terrific, but the warm sticky buns were too moist to eat neatly out of hand. We were polite and used forks, at least at first, and no one complained about the flavor or the messy fingers. This almond filling substitution still needs some tweaking, but it's definitely worth working on... after we deal with the nine-bun pan that still remains uneaten. Two varieties of Frittata Muffins provided some tasty protein choices. Note: These mini frittatas were prepared earlier and went directly from fridge to a 375 F oven, requiring an extra 8 minutes of cooking time to set the centers, roughly 23 minutes in total. One frittata filling, my favorite, combined slivers of lox, green onion tops, chopped red onion, capers, mushrooms, ricotta cheese, lemon zest, dill weed and shreds of swiss cheese distributed in 6 large prepared muffin tins. The 6 large eggs whipped with 1/2 cup milk, freshly ground black pepper, Italian parsley and more dill seasoning filled the muffin tins 2/3 full, leaving some room at the top for the egg mixture to puff during baking without running over. Mmmmmm, good eating. The second batch of mini frittatas combined cooked Basque chorizo chunks, diced sweet peppers, fresh cilantro, pepper jack cheese and chopped red onion. This egg mixture was flavored with a generous teaspoon of hot sauce, dried cilantro, salt and pepper and a dash of smokey Spanish paprika. Served with salsa, sour cream and avocado chunks this SW favorite made its way onto several plates. The fresh strawberries were colorful but too lacking in sweetness and berry taste to serve them as is. Cut green grapes, a handful of shredded fresh mint and a quarter cup of our favorite Minty Honey Lime Sauce took care of that concern. Presto! a fresh fruit salad with flavor. Add a bowl of fresh, local cherries, a plater of warm Canadian bacon and brunch was complete. We all enjoyed the menu, but the best part of today's brunch was the company we shared it with. SourdoughSurprises announced crepes would be the June sourdough challenge. Hooray! there are a gazillion possibilities for recipe choices; sweet or savory, seasoned or plain, filled or not, rolled or folded or stacked... see, a gazillion choices. I have typically made crepes for breakfast or brunch, on rare occasions prepared them for dessert or even an occasional appetizer. Somehow crepes never appear as a "serious" entree. It was time to remedy that. 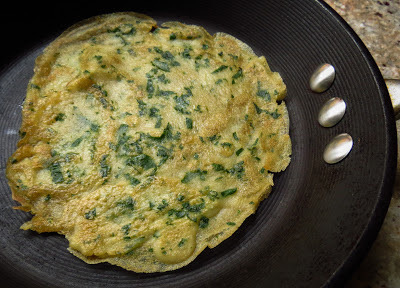 Savory crepes tempted me this week, thin and lacey with a handful of chopped parsley and green onion tops stirred in to the usual batter. Please note, that's stirred in by hand, not in the blender, since green-colored crepes were not the effect I was after. 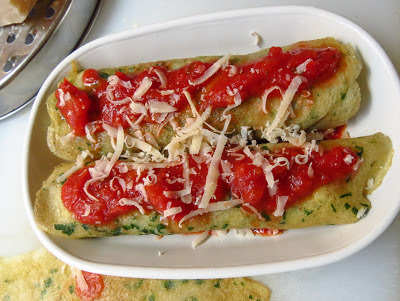 Crepes are a traditional option for Italian cannelloni so that dish was an easy choice, though my filling was decidedly untraditional. RL favors spicier Southwest flavors, so another alternative was crepe enchiladas. 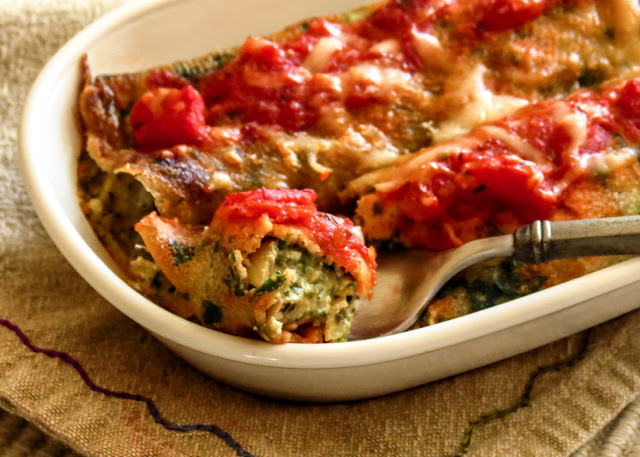 Swap chunky salsa with chunky tomato sauce, add a generous splash of Green Tabasco to the mushroom and artichoke filling, change up the cheeses and presto! I had two variations using the same savory herbed sourdough crepes. It's no secret that I love my sourdough starter for the subtle, sour tang it lends to breads, rolls, pancakes and waffles. Keeping that starter happy involves talking to it occasionally, feeding it weekly, and then dealing with a lot of excess starter. 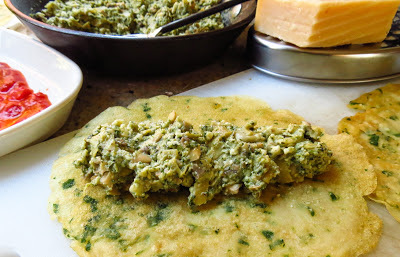 Excess starter is no problem when sourdough crepes are so easy, so tasty and so versatile. Preheat a small frying pan over medium heat; cast iron or nonstick are good choices, 8" is a good size, but smaller or larger work too. Note: ridged bottoms in some nonstick skillets are definitely NOT crepe friendly, they want to hold onto the crepe when you want to flip it over. It's doable, but takes a bit lot more care. Add a scant teaspoon of butter to the heated pan and let it melt. Pour in a scant 1/4 cup of batter, swirling and tilting the pan so it runs to the edges and coats the bottom of the whole pan. Hint: hold the pan with your favored hand, righty or lefty, and tilt and swirl while you ladle in the batter with your other hand. Cook for a minute or more till the batter sets and the bottom browns slightly, then flip over to cook the second side for 30 seconds or so (more if you like your crepes slightly crispy). I use a rubber spatula to loosen one edge and then flip with my fingers, but choose your own method. Ease the crepe out of pan and set aside on a sheet of waxed paper while you cook off the remaining batter. Serve crepes plain or top with a sprinkle of sugar and a squirt of lemon to eat right away, or serve rolled or folded with your choice of filling. Crepes freeze really well, but defrost and bring them to room temperature before rolling or filling to prevent cracking. Lightly coat the bottom of a baking dish or several ramekins with a skim coat of pasta sauce. Divide filling into equal portions. Place a line of filling down one side of a crepe and roll to enclose. Place seam side down in baking dish. Repeat, arranging filled crepes next to each other but not overlapping. Spoon remaining red sauce on top, sprinkle with additional Parmesan. Bake 15 minutes at 350 degrees F until cheese melts and filling is heated through. It has been a while since I have cooked with this amazing group, but this month's theme was too good to pass up. 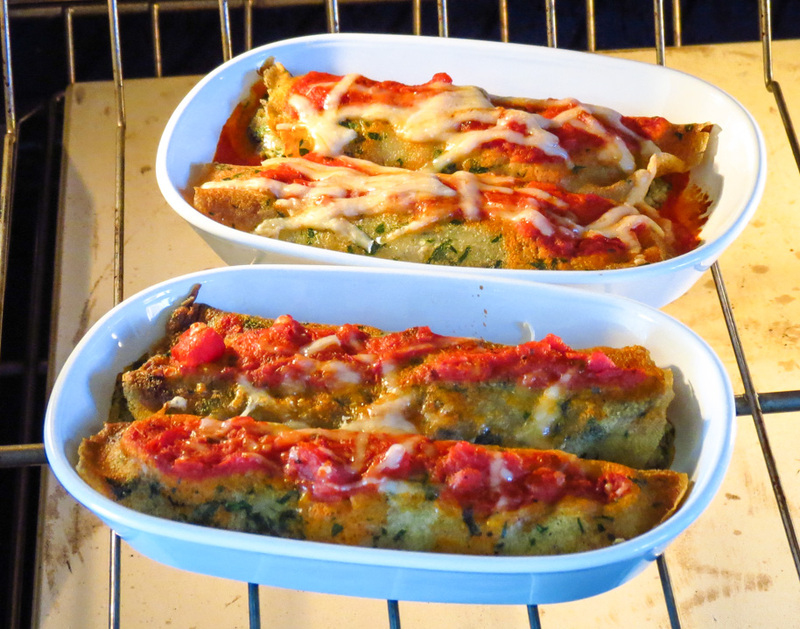 "The June Daring Cooks’ challenge sure kept us rolling – meatballs, that is! Shelley from C Mom Cook and Ruth from The Crafts of Mommyhood challenged us to try meatballs from around the world and to create our own meatball meal celebrating a culture or cuisine of our own choice." I think June just might be meatball month, since they are popping up all over the internet lately; here, here, here and here... and many more! Just say "meatball" and boom! I think Italian spaghetti and meatballs, then Swedish meatballs with potatoes and lingonberry jam, followed by Mexican albondigas soup, Greek avgolemno soup with meatballs, and the list goes on. Then my foodie brain slowly wanders off into non-meat territory with Japanese rice balls, Italian arancini, Middle Eastern falafel... Which to choose for the June DC challenge? Even though polpette are not typically served over pasta or even sauced, I decided to prepare Italian spaghetti and meatballs with a red sauce and got busy organizing ingredients. The first sample meatball was just fine naked, all by itself, it didn't need any sauce for flavor. But I continued on with the plan and oven-simmered a batch of 12 meatballs in Spicy Red Bell Pepper Pasta Sauce from my local Safeway store. We loved the result. Go with the sauce. My personal challenge was to create a moist, tasty meatball using lean ground turkey, a protein often thought of as bland, often dry and easily overcooked. So why use turkey? "Outside pressures" to cook healthier and cut back on red meat prompted the choice, and I'm delighted to report that this experiment was deeeeee-licious. RL loved the meal and nagged coached me to write down the recipe before I forgot quantities and procedure. The Daring Cooks Challenge suggested we plan a meal to incorporate the meatballs. My imaginary multi-course Italian menu begins with Fruit and Nut Crisps served with a soft cheese, followed by Spaghetti with Turkey Meatballs, then a salad of Greens with Grapes and/or Italian Pepper Salad, and finished with Almond Cookies and Nutty Chocolate Apricot Bites. Reality check: instead of that big meal, we will likely dine on a small plate of this recipe, accompanied by a green salad dressed with citrus vinaigrette. I know I will make these meatballs again and again, and continue to marvel at turkey meatballs that are packed with flavor, have a nice crunchy bite and are healthier than any of my previous versions! Add to a blender jar and mix until combined into a very moist, green paste with no big chunks remaining. Place that luscious green blend in a mixing bowl, add the following 4 ingredients and mix gently but thoroughly by hand or with a spatula. Note: this is a good time to cook a small patty in a skillet, taste and adjust seasonings as needed. You really don’t want to skip this step. Use a scoop or tablespoon to shape the mix into small meatballs. Brown in a skillet sprayed with cooking spray OR broil briefly until browned. Add enough of your favorite marinara sauce to surround or even cover the meatballs and simmer for 15 minutes over low heat, covered, on the stovetop OR bake uncovered for 15 minutes in a preheated 350 F oven. Serve alone or over pasta, they are delicious either way. It's officially Strawberry Season! and I can't get enough of that gorgeous, tangy cone-shaped fruit. Mmmmm, just inhale the aroma of some fresh-picked berries, anticipate the sweet burst of flavor when you finally taste one... or two... or a bowlful. These berries taste like sunshine and summer. I knew my Secret Recipe Club post for this month just had to include strawberries. 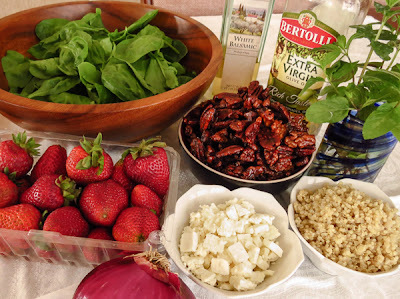 Luckily Heather's blog, joinuspullupachair, held the perfect candidate, a vibrant and flavor-packed recipe for Strawberry Arugula and Quinoa Salad. Her recipe for Rum Glazed Roasted Pecans joined the party and the resulting salad was capital-D Delicious. This duo was such a hit, I can't wait to try some of Heather's other tempting recipes. There are countless versions of this Spring classic, with a wide variety of possible ingredients and dressings, and I have enjoyed each version I have tasted so far. How could you go wrong when you start with baby spinach and strawberries? The quinoa added some healthy fiber and protein to this salad, but was a pesky nuisance as it kept dropping off the fork. It presented a comical, messy challenge to try to capture or eat in a mannerly fashion. Minor changes: I substituted spinach for the original arugula that I knew RL would reject, added a handful of fresh mint for brightness, and tossed in some slivered red onion for its bite. Use a large bowl and add the spinach, strawberries, cooled quinoa, half of the feta cheese, half of the roasted nuts and a generous sprinkling of mint leaves. Toss to combine. 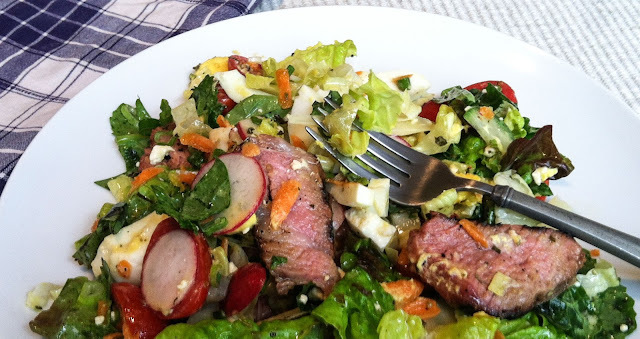 Lightly dress with the vinaigrette and toss again. Top with the remaining feta cheese, roasted nuts and mint leaves. Serve, and wait for the compliments. In a medium saucepan, heat both sugars, salt and 2 tablespoons of rum over medium to medium-high heat until it boils. Reduce the heat to medium-low and stir until the syrup starts to turn clear and non-granular. Take care not to burn the syrup. Add the pecans; use a heat-proof spatula and stir to coat each nut. The mixture will be thick and stiff, but don't worry. Once the pecans are coated, carefully add in the remaining 2 tablespoons of rum. The syrup will loosen up at this point. Stir continuously until the syrup returns to a boil, being careful not to burn the nuts or sugar coating. Spoon the pecans onto the prepared baking sheet. Bake for 10 to 12 minutes until the syrup appears hard and once again, be careful not to burn the nuts - they scorch easily! Remove from the oven and allow to completely cool on the baking sheet. Break apart to separate the nut clusters and store in a cool, dry place.